The technology of whole body vibrations are accepted world wide by hospitals, rehabilitation and therapeutic centers. This machine is designed to transmit vertical vibrations throughout the body while standing on its platform. The vibration intensity is set at the factory to allow maximum benefit to the user. Another amazing benefit of the Live Vibe is that it is great for staying in shape! The vibration can strengthen and tone the body while delivering circulation and flexibility throughout the body. 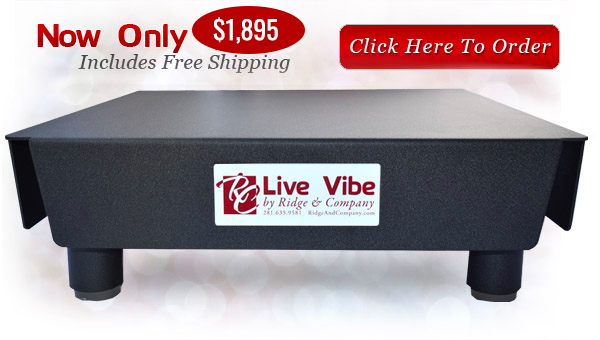 Medical clinics tell their patients to use a Live Vibe for 15 minutes a day, 3 times a week to gain all of the great affects as listed above. Users of the Live Vibe include, but are not limited to; athletes, at-home use, public and private health clinics, resorts, nursing homes, and senior citizens centers.